The release of the new Brave Noise album came as an odd but very real threat to the busy work of packing my car for my extended beach vacation. A link to the new songs came in just as I was experiencing a lull in shoving brightly-colored buckets and pails into my trunk, so I set out in search of my headphones. Truth be told, I've got a terrible soft spot for local bands from the Washington/Maryland/Virginia area, so when I do get the opportunity to review something that's not shipped in from distant shores, I generally jump at the occasion hoping they don't disappoint. 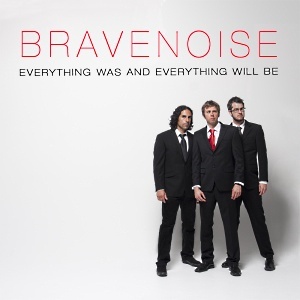 Bravenoise consists of Andrew Bell, Andrea Spadafora, and Garron Marsh, an amicable-looking trio with a somewhat undefinable charm and a unique sound. In the face of the sonic maelstrom of the skin-melting full-on guitar assaults I'd been peppering my playlist with recently, they offered a cool melodic oasis with jangly guitar sounds and pared down arrangements. That's not to say they can't rock a tune, but the musical direction shifts from song to song, allowing for the sharp contrast of the slower pieces to sweep aside the foot tapping infectiousness of their uptempo work. Put simply, I liked what I heard. Never mind that their drummer sites the master of all things percussion (Stewart Copeland, for those of you under a rock) as a huge influence or that their lead singer openly admits to being a huge Voltron fan as a child. These things alone could never have rose colored my glasses enough to elicit a positive response that was not warranted by the music alone. Check out Everything Was And Everything Will Be on iTunes or Amazon and pay particular attention to my personal favorite "Night Of Pleasure" or the oddly familiar "Come Onto Me" ( *cough* Police *cough*).